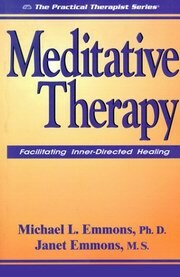 As an explanation of the therapist's role in guiding clients' emotional, physical and spiritual growth, this comprehensive manual offers the professional therapist the therapeutic procedures that facilitate inner-directed natural healing and recovery. Two decades ago, Emmons' popular work, The Inner Source, showed thousands of readers how to tap their own powerful "inner source" of emotional healing. Now he offers to the professional therapist a full description of the therapeutic procedures that facilitate inner-directed healing and explains the therapist's role in guiding clients' growth psychologically, physiologically and spiritually. Stimulating, Directing and Interpreting The Inner Flow. Michael L. Emmons, Ph.D., is a psychologist in private practice, consultant to educational, government and business organizations. He is co-author, with Dr. Robert Alberti, of Your Perfect Right; Stand Up, Speak Out, Talk Back; and Accepting Each Other. Janet Emmons, M.S. is a marriage and family therapist in private practice.